Trump loses. Loses big time. We Democrats tried to give him his wall, but, TeaPublicans blocked it. Got that? 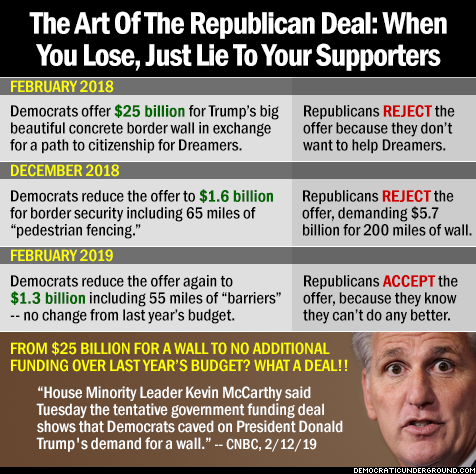 One year ago — February 2018 — we Democrats offered Trump $25 billion for his big, beautiful wall. The TeaPublicans in Congress killed that proposal. Now, Trump is getting $1.3 billion for a few miles of barbed wire fence. Next Post There are stupid people, there are VERY stupid people, then, there are Trump voters.